Those who watched last night's episode of Sons of Anarchy know that "Laying Pipe" marked the end of the road for one of the main characters on the FX biker drama. Series creator Kurt Sutter spoke with the press today on a conference call to discuss the character death and what it means for the series in general. If you haven't seen Sons of Anarchy's "Laying Pipe" episode yet, stop reading now! Major spoilers ahead! The death of Opie (Ryan Hurst) was one of the more brutal moments of the series, and this comes just two episodes after we saw a girl being lit on fire and burned to death while her father (Tig) watched and could do nothing to stop it. Sons of Anarchy has a way of redefining the word "brutal," I guess. I shared some of my own reactions to Opie's death last night after "Laying Pipe" aired. And today, Kurt Sutter answered some questions about the episode, including why he decided to to kill off Opie at the beginning of the season. According to Sutter, it all started in Season 3 with Piney's death, which led to him considering Jax and Opie's relationship. 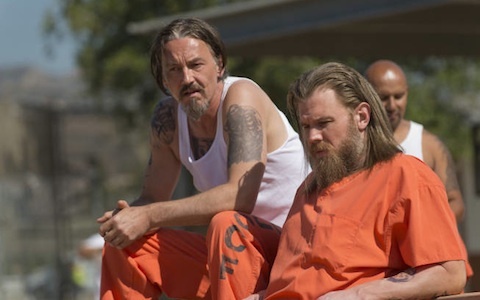 I got to the end of that season and realized that there is this circular dynamic that was happening with Jax and Opie that I felt it was very difficult to get out of in terms of where their arc was going. Of course, Ryan is an extraordinary actor. As we came into this season, knowing - as I've said in the past, this is really the first season I've had to think about the end game - where I want to take my hero and knowing how I want him to get there - the road that I want him to travel - Jax needed that emotional upheaval, that one event that happens in a man's life that can change the course of his destiny. And I think the death of his best friend was that event. I wanted to do it at a point this season that didn't feel - I wanted it to be organic, but I also wanted it to happen early rather than sort of having it be like the finale. One of the things I mentioned last night was hoping that, at the very least, Opie's death wouldn't be in vain. Sutter addressed that very thing, saying that Opie's death would have an emotional impact on the characters that would always be there. "Yes it's incredibly sad but the death of Opie will color the rest of the episodes for the rest of the series," he told us. "It's not a death that will happen in vain." Opie was a character shrouded in tragedy and sadness, from the death of his wife Donna to his failed marriage with Lyla and then of course, his father Piney's death last season. He'd been through enough to want to walk away from the club. Of course, he came back one last time when he showed up to get arrested with Jax. That in itself seemed like a sacrificial move. But in "Laying Pipe," it looked like he volunteered himself to be the "Son" who was killed. Just as Jax was about to go all in and fight the guards, Opie stopped him and attacked the guard first. Was he offering himself up for the good of the club? Was he throwing in the towel after years of frustration, disappointment and grief? From what Sutter says, it sounds like Opie was in the mindset of serving the club when he made his choice. I just felt like we had done so much damage to Opie and his family over the course of a few of seasons. It's why I couldn't wrap my brain around bringing him back to the table at the end of last season. That didn't seem right. To me, there is a sense of him having this tremendous loss. Yes, I do believe that some of it was definitely a sense of "Here's an opportunity to go out as doing the right thing. Perhaps this is how I can be of best service to my club." And in a weird way - maybe it's a selfish way - but also to his family. I always got a sense that Opie struggled with those kids ever since he got out of prison. He never really felt connected to them. He never really felt connected to his family. Obviously the Lyla thing was somewhat abrupt and some kind of distraction. And perhaps this was his way of being of service to his club and his family as well. The sense of his dad going out doing the right thing. And you could argue against that, that it was the selfish thing to do. I believe that had a lot to do with it. That it was this sort of personal choice of personal sacrifice. My intention in that scene was that Jax wasn't going to let anybody force him to make that choice, even if it meant him making that choice himself. I felt that Opie saw that in Jax and had to step in and make that choice. 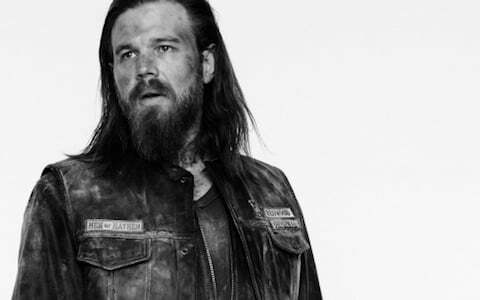 It's going to be sad not seeing Ryan Hurst in the show anymore or seeing Opie among the guys when the club is together, but it sounds like Sutter has an end game in mind and Opie's death factors into that. With that in mind, it's easier to take the loss of the character as a viewer, I think. Opie was one of my favorite characters. Another is Juice, whose "secret" has yet to be revealed. We know he was secretly working with Roosevelt last season, and while that issue seems to have been shelved for now, Sutter hasn't forgotten it. It sounds like it will be addressed eventually. "Not to spoil," Sutter said. "but I think that the circumstances that we're laying track to now will ultimately lead us to Juice and his secret." Interesting! As much as I hate the way that "secret" is hanging out there just waiting to exposed, given the loss of Opie, I sort of hope Juice doesn't get called out for it anytime soon. Read our full episode breakdown of "Laying Pipe" here. And check out the preview for next week's episode below.